Mise en place (pronounced ‘meezon-plas’) is a French term which means “putting in place”. It’s most frequently used in a culinary context, where it signifies that you should prepare all the necessary utensils and ingredients before you start cooking. This simple concept is one of the most effective tools used by chefs and amateur cooks, which is why it’s a required skill in culinary schools and high-end restaurant kitchens. In the following article, you will learn more about mise en place, and about how you can apply it in the kitchen, as well as in other areas of your life, in order to improve your workflow and become more efficient. First, choose a recipe, and figure out which ingredients and kitchen utensils are needed. Doing this before you start cooking allows you to spot missing items before it’s too late to get them or to change a recipe, and allows you to plan ahead properly. Prepare all the ingredients so that they’re ready to be used. This means that each ingredient should be ready for you to use as you cook, without requiring any additional preparation. Essentially, you should measure what needs measuring, chop what needs chopping, etc. 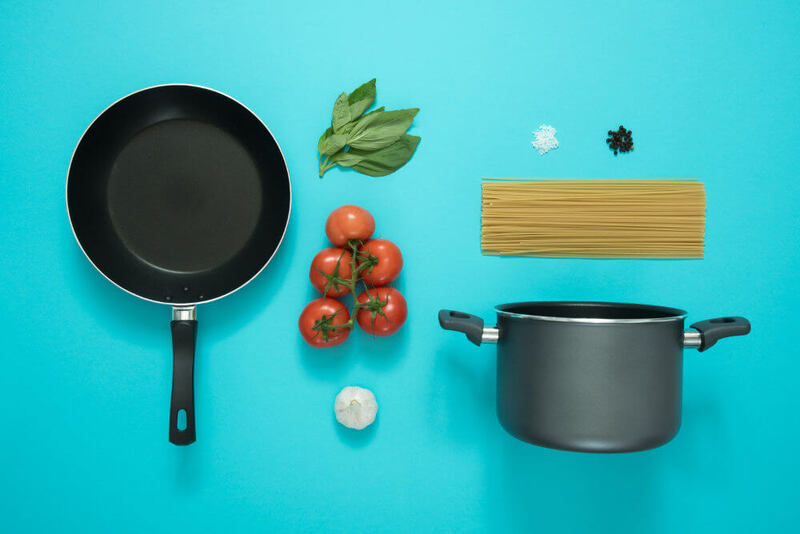 Group ingredients and utensils together, so that they’re easy to find and use while cooking. If possible, arrange them in the order that you will be using them. Essentially, you want to make it as easy as possible for you to find the necessary materials as you cook. If there are ingredients that require extensive special preparation, you can prepare them before you start the main cooking process, so that they don’t cause a delay in the middle of cooking. Examples for such cases include dough that needs to chill in the fridge or nuts that need to be roasted in the oven. Preparing these things in advance ensures that you don’t get stuck with long waiting periods in the middle of cooking. You can use short waiting periods during the cooking process in order to get things ready for the next step in the recipe. If there’s nothing that needs to be done at the moment, you can use these waiting periods in order to clean up as you go along, instead of leaving all the cleaning to the end. This helps keep you engaged in the process, and saves you from having to deal with a huge mess when you’re finished. If you follow these steps, cooking will turn from a haphazard attempt at juggling multiple things simultaneously, to an organized, enjoyable, and more successful process. Of course, to do this properly, you need to make sure to give yourself enough time. Rushing things will often lead to more mistakes, and will make the cooking process less successful and less enjoyable for you. While mise en place is most commonly associated with the cooking process, many people use it as a guiding principle in order to increase their productivity and improve their workflow in other areas. There are some superficial differences in such cases: your ingredients aren’t food, your environment isn’t a kitchen, and your tools don’t consist primarily of knives and pans. However, the idea behind this technique remains the same: better planning, preparation, and organization ahead of time facilitates the work process later on. This is especially important when dealing with tasks that require a high degree of concentration, where even a small distraction can lead to a significant interruption to your workflow. For example, a person engaged in a programming task can take 15 minutes to recover after even a brief interruption. Furthermore, in addition to this resumption lag, task interruptions increase the odds of making errors after returning to the task. Therefore, it’s important to minimize these potential distractions and interruptions as much as possible ahead of time, which you can do by planning accordingly before you start working. Clearly outlining the tasks that you intend to go through, and identifying what you will need in order to complete each. Ensuring that you have the necessary material and tools necessary to complete each task, and arranging them so that they can be retrieved without interrupting your workflow. Arranging your tasks in a way that optimizes your work process, which you can do, for example, by batching together similar types of tasks. Note: If you want to read more about the concept of implementing mise en place in your workflow, the “Work Clean” book is highly recommended. It also discusses other helpful concepts which can be used to boost your productivity, such as slowing down to speed up, which entails that it’s better to let yourself take longer to perform an action, if it means that doing so will lead to improved performance overall, and save you time in the long run. Mise en place is a productivity technique which entails planning, organizing, and preparing for a task before you start working on it. Usually, this entails outlining the task, figuring out what material and tools are necessary, and preparing everything in advance in the best way possible, so that you can easily use whatever you need without interrupting your work process. Mise en place is most commonly applied in kitchens, where it can be used in order to help you cook better and enjoy the cooking process more. This technique can also be applied in other areas of life beyond the kitchen, and can be used in order to improve your workflow and productivity in general. Mise en place is especially helpful in tasks that require a high degree of concentration, where preparing things in advance preparing can help you avoid costly distractions and errors.